Overall a very good experience. Very expensive room rates, but we knew that. Front desk checkin was painfully slow (over 20 minutes). We had a room reserved and arrived an hour after checkin began. Our Disney cast member that checked us in was very, very slow. We told her that we had Fastpasses that we needed to get to, but it didn't seem to make her move any faster :( Maybe Disney should offer a Fastpass line at checkin??? Pool-view room was comfortable for four. Hotel was spotless! We were able to see MK fireworks from Grand Floridian. Everything else was great, except for the security guards that work on the monorail on the second floor. Why don't they wear gloves when they dig through guests purses? This practice spreads germs and potential diseases! It should be a Disney policy that all security that checks purses/bags wears disposable gloves and uses a security wand to look through a bag. We offered him our hand sanitizer before he put his hands in our bags and purse, but he refused. Disney needs to come up with a 21st century solution. Great resort ! Everyone was friendly , the room was clean with a great view and dining was wonderful!! Good hotel If year was 1992 and you enjoy the smell of a musky moldy room and the smell of a putrid sewer when you run the water. Pool area lifeless, grounds around hotel lifeless, staff was fine and pleasant. Aside from staff, Grand Floridian felt like a cheap crappy motel, not a flagship resort. A 1992 interpretation of 1902 .. with sewerage smell. Nice hotel and comfortable rooms. The restaurants on property are nice and the pools are great. Septemeber crowds were extremely low which made it nice because it wasn't so crowded. Gorgeous hotel. Would definitely recommend it to others! I would also stay there again!!! Everything was great! We missed service for a day but a bin of towels was left outside of our room. We felt really taken care of here and wouldn't hesitate to stay again. The room was not as purchased to be a King size bed. I immediately contacted the front desk and they told me it was the fault of EXPEDIA because they do not guarantee a bed size! I complained further to a manager named Peter at the front desk who basically told me too bad take it up with EXPEDIA. tHIS WAS THE WORSE TRIP EVER. ! i WILL NEVER GO TO THE FLORIDIAN AGAIN. PROBLEM RESPLUTION WAS ZERO. HORRIABLE EXPERIENCE. Marcine, my wife of 55 years, my mother in law Lorraine age 96, my daughter Michelle and her husband Sean, and our grand daughter Holly age 5. We spent 5 of the most wonderful days in Disney World at the Grand Floridian. I previously had spent our 25th and 30th wedding anniversaries at Disney World and were surprised to see we had been upgraded to concierge service. What a great surprise. The staff at the hotel were all very supportive. Everyone in Disney World treated us as honored guests. We enjoyed our time in the parks and at the facilities at the hotel. The monorail was the easiest way to get around the park for all age groups. I am retired military and I really appreciate the added benefits that afforded us. I would recommend anyone who enjoys smiles spend some time with their family at the Grand Floridian and Disney World. Beautiful, clean hotel. Staff are very welcoming. Lots of food options, one including a 24 hour restaurant. Ferry, monorail and bus to the parks. Quick walkover to the Polynesian as well. Gym is small but gets the job done and there is a spa on site as well. Loved it and will stay again. We have stayed here a number of year ago and this time was even more special. You are surrounded by staff who want to help always ask for something you do not see but want or need. My 96 year old Mother was with us and it was wonderful for her as well. Disney upgraded our rooms there were 6 to club level some know it as Concierge level and we were so surprised. We were in our own building just a short walk from the main hotel in Sugar Loaf. Wow food and drinks were yummy 4 times a day it changes and something fresh all the time and for the kids too. We had our 5 year old Granddaughter with us and there were chairs and tables her size and food choices she loved and a TV showing films for them all the time. I can't say enough about the friendly staff ready to help us at anytime. The Grand Floridian is my favorite place to be with easy access to the monorail and in the park so with small ones you can come back for a rest and then go again. I took a day just to enjoy the pool, and spa and the great kids pool as well. If you are headed to Disney World check it out and if your an active duty or retired Military please don't forget to check on what is possible with military discounts. Our children want to return next year so the planning has begun. This was our 2nd weekend stay (2 nights is about all I can afford of this level!). Staff were fantastic, polite. Alicia at check in/front desk went above and beyond to make our stay 5 star. Rooms were very clean both stays, beds and pillows super comfortable, refrigerator in room is fairly large for a hotel mini-fridge, WiFi access was good at various locations around the hotel. Free events: princess parade, orchestra, pianist, & more. There are a variety of restaurant price levels, food is generally very good, even the counter service ones. Parking is free and allows you to park at the park free as well (Saves $20). If you like to feel pampered and surround yourself with Southern Charm and luxury, this is the best Disney hotel for it. The downside is if you spend the majority of the day & night at parks, you don't get to appreciate all the Grand Floridian has to offer and it's a steep price to pay to sleep and shower there. The benefit of the resorts that have monorail and boat transportation to Walt Disney World is the ease of getting in and out quickly (compared to taking the boat/monorail and walking to catch a tram to the parking lot, dealing with traffic jams). This is a big reason I'd choose to stay at an onsite resort. Even on a sold out weekend, it wasn't excessively noisy and the children staying here were generally well behaved compared to the wild ones I've experienced at the value hotels onsite. It's a lovely experience overall. Stayed during Hurricane Irma in September 2017. Staff did a great job keeping everyone safe and secure. Because we were celebrating our 8yr engagement (done at GF) 6yr marriage (July) and daugeters 2nd bday. They upgraded up to the club level (concierge). From the moment we arrived the place was emaculate, prestine, and well kept. every single employee went out of their way to greet us and say "Hello Princess" to my 2 y.o. daughter from the front desk manager to the guy cleaning the toilets. It made us feel very welcomed and special. The room was incredible his and her sinks and a wrap around balcony. The only issue I had was the mattreszs was a little uneven and gave me back pain in the morning. BUT, besides that this has been the best Disney hotel stay I've had, and i've been visiting Disney for a good 15 years of my life. The rooms was great. The view was breath taking and very clean. The only bad thing was the transportation, monerail not running and no buses running. 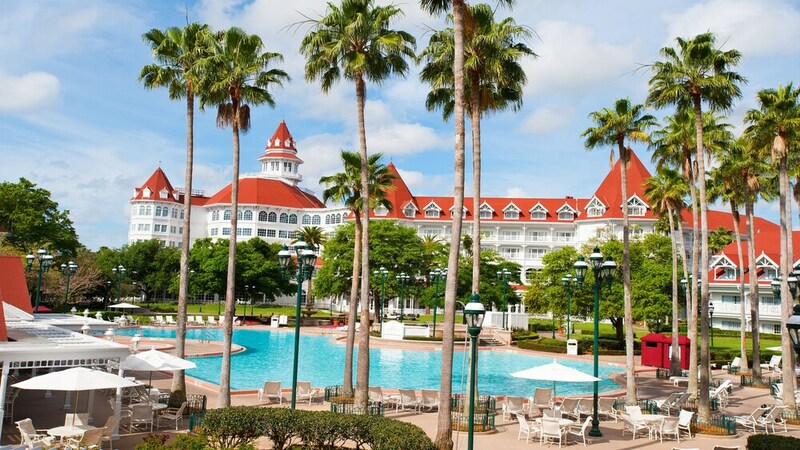 Located in Bay Lake, Disney's Grand Floridian Resort & Spa is within a mile (2 km) of popular sights such as Disney's Palm Golf Course and Disney's Magnolia Golf Course. This 867-room, 4.5-star resort has 2 outdoor pools along with a full-service spa and 7 restaurants. Enjoy dining at Victoria and Albert, one of 7 onsite restaurants. Order from room service to satisfy your hunger without leaving your room, or explore the resort and get a beverage at the bar/lounge or coffee shop/café. For your convenience, breakfast is served for a fee each morning. A TV comes with cable channels, and guests can stay connected with free WiFi. Other standard amenities include a balcony, an MP3 dock, and a sofa bed. Guests of Disney's Grand Floridian Resort & Spa have access to a full-service spa, 2 outdoor pools, and a children's pool. Valet and self parking are available, and there's also limo/town car service. Multilingual staff at the front desk are standing by 24/7 to help with concierge services, securing valuables, and dry cleaning/laundry. Other amenities at this beach resort include a fitness center, a conference center, and a business center. Victoria and Albert - Restaurant and bar serving dinner. Reservations required. Citricos - Restaurant and bar serving dinner. Kid's meals available. Narcoosee - Restaurant and bar specializing in seafood and serving dinner. Kid's menu available. Reservations required. 1900 Park Fare - Buffet restaurant and bar serving breakfast and dinner. Grand Floridian Cafe - Café and bar serving breakfast, lunch, and dinner. Kid's menu available. The resort has 2 outdoor swimming pools and a children's pool. A waterslide and a fitness center are other recreation options.